This year, John and I are on board with Meatless Mondays, but I don’t want to rely on recipes I already know and simply omit the protein. 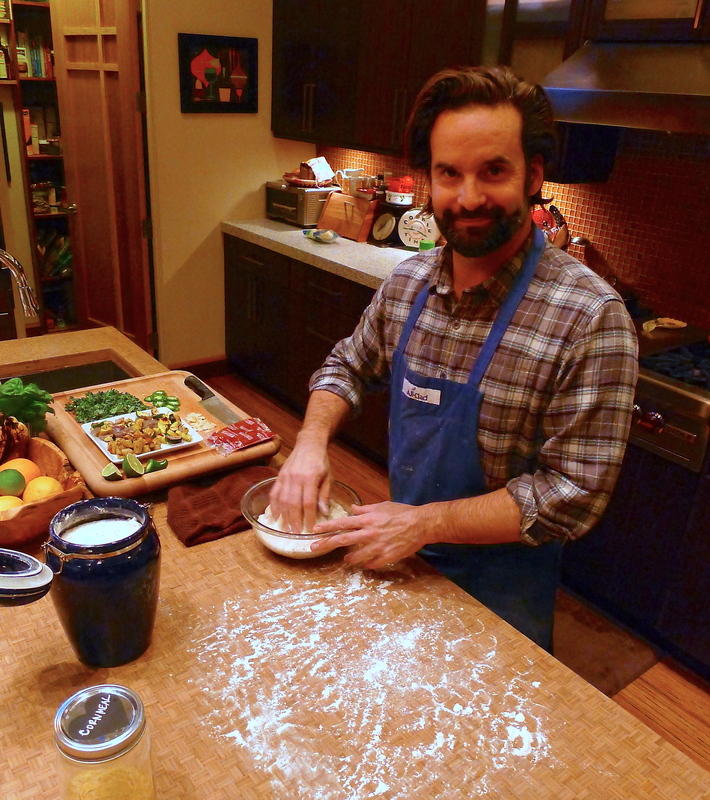 I love the challenge of trying to create dishes so delicious that you don’t even miss the meat. 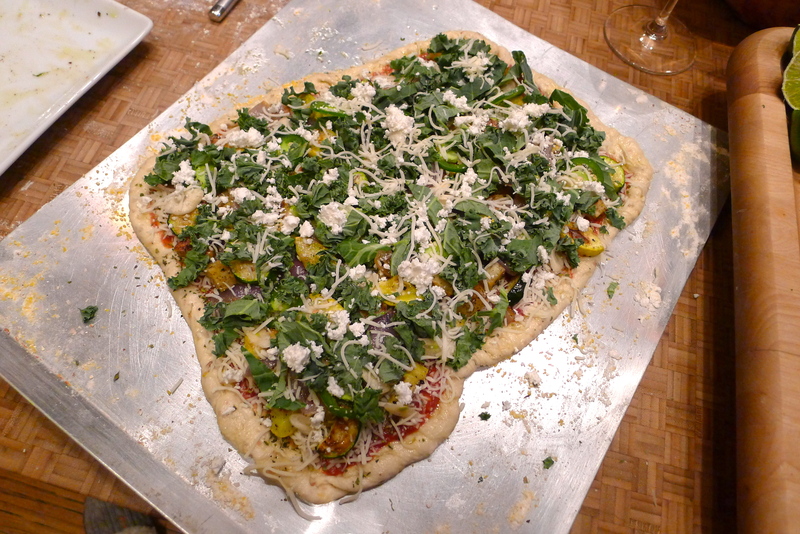 Last week, we made pizza. Yes, again. 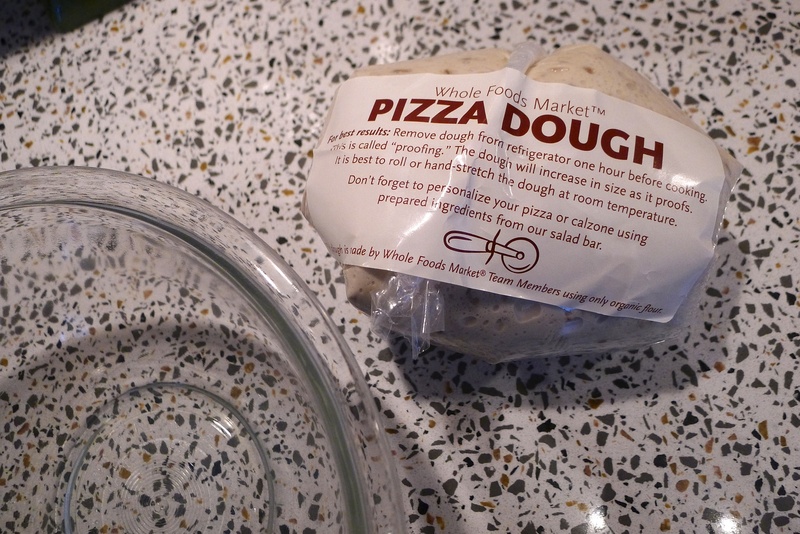 Though we’ve made homemade dough, we usually pick up a ball of Whole Foods whole wheat dough. It’s like a blank canvas- anything goes! 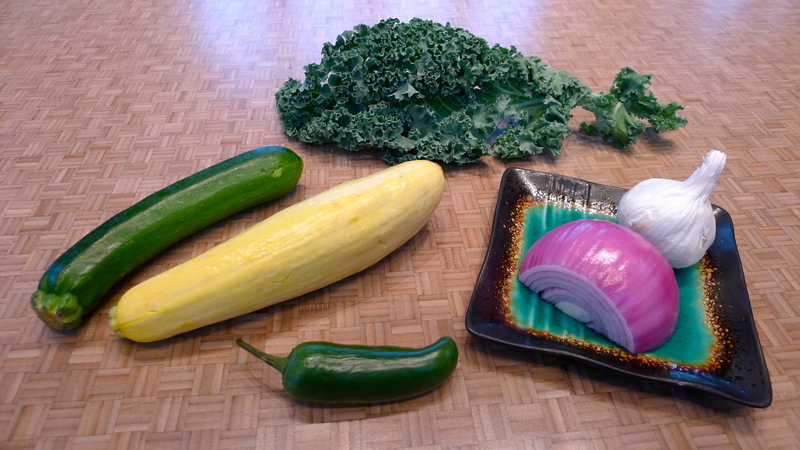 For Meatless Monday, I basically cleared out the veggie drawer: zucchini, squash, kale, half of a sweet potato, a jalapeño, and an onion. 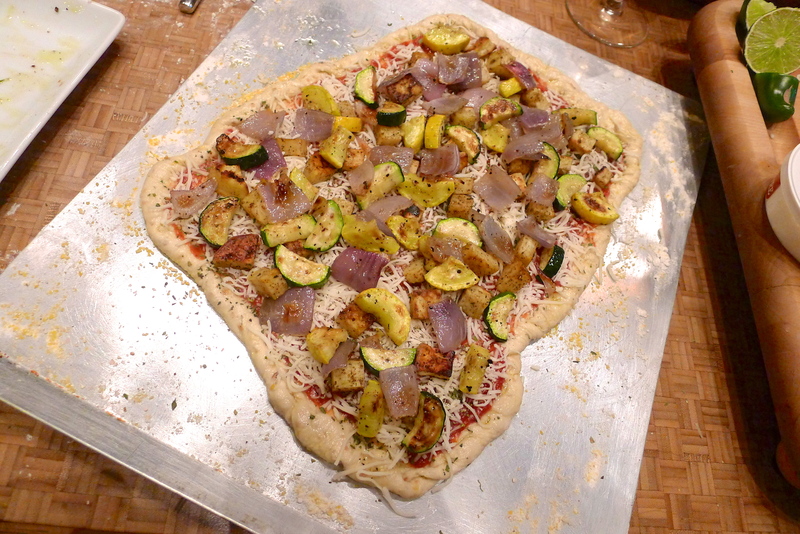 Instead of just slicing the veggies and putting them on the pizza raw, I thought roasting them would bring out some different flavors. So that’s what I did. I roasted the sweet potatoes separately, because I thought they’d take longer in the oven than the other veggies. 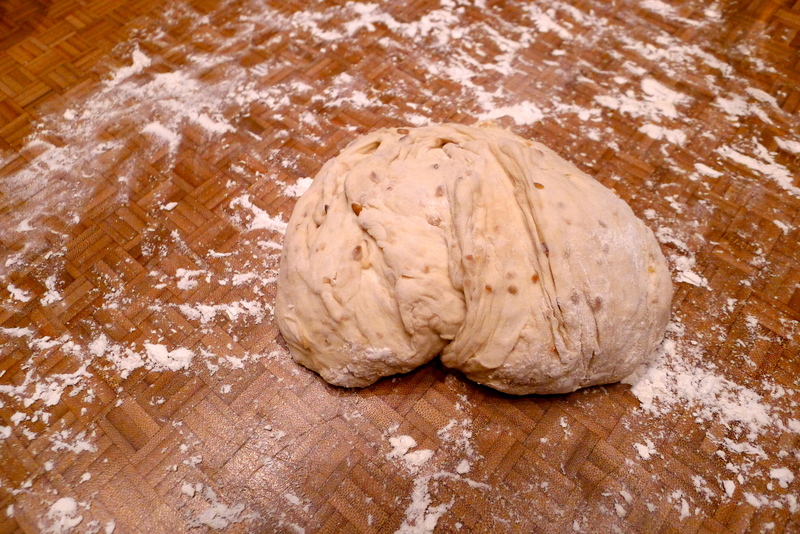 All the ‘taters need is drizzle of olive oil, some Italian seasoning and salt, and 20 minutes in a hot oven. I usually toss the potatoes halfway through so all sides get a little browned. 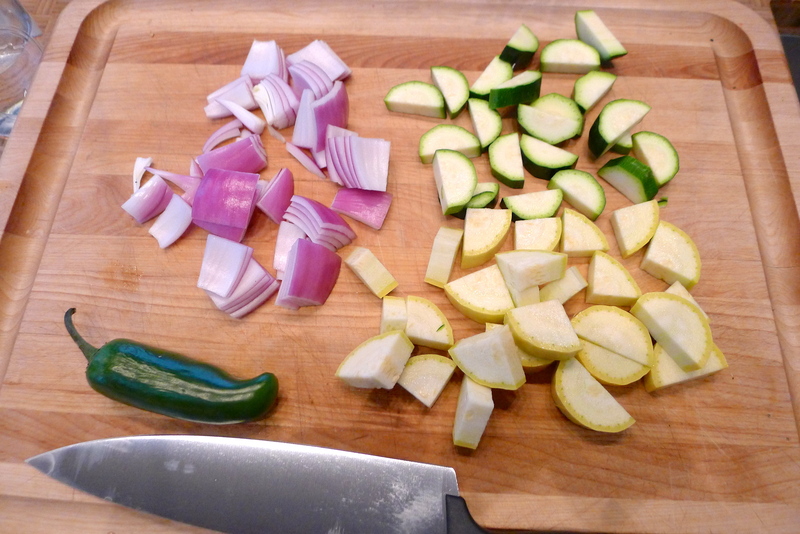 While the sweet potato was in the oven, I chopped up the onion, zucchini, and squash into big chunks. 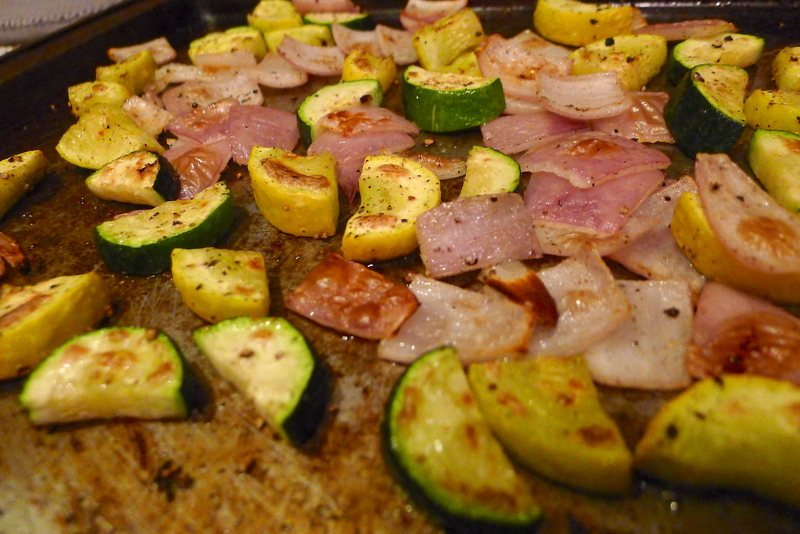 I tossed them in a little olive oil and sprinkled them with salt and pepper and let them roast for about 10 minutes. They weren’t getting the browned bits that I wanted, so I turned on the broiler for a few minutes. Yummy! 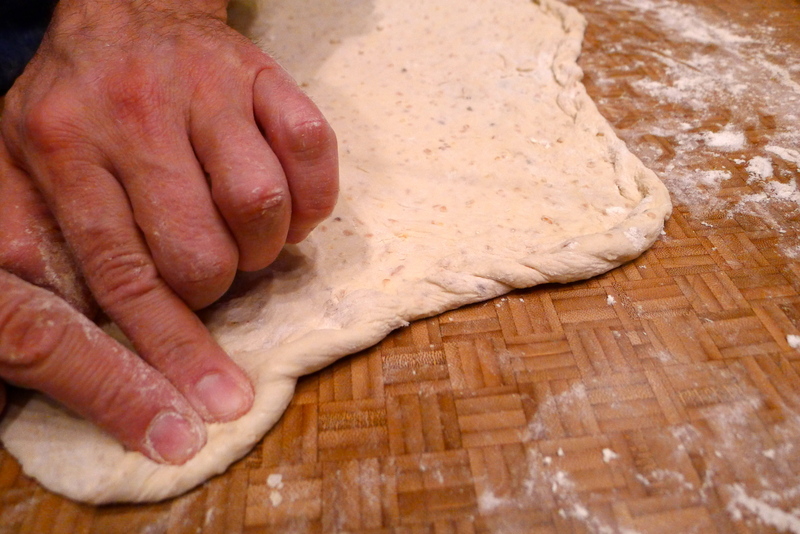 After twisting the edges of the dough, John transferred it to a sheet pan with flour and cornmeal on it. 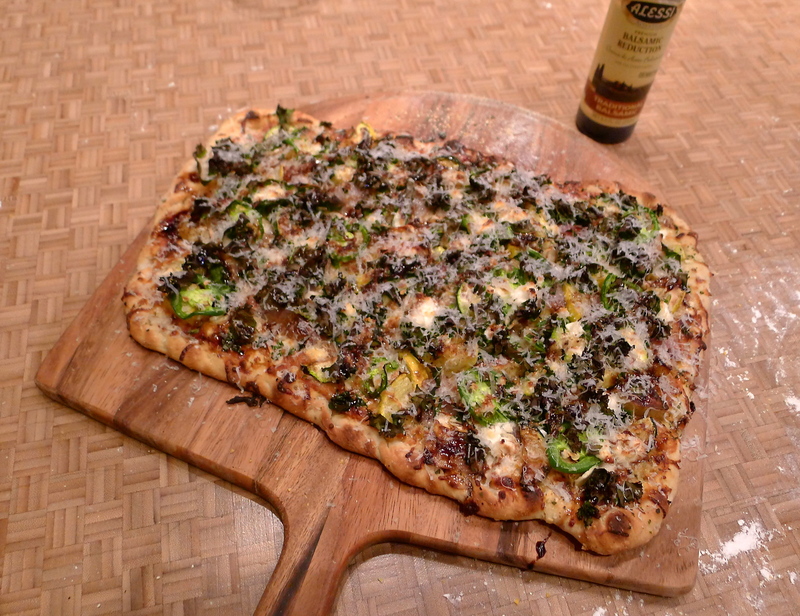 I brushed the edges with olive oil (for browning) and started adding the toppings. 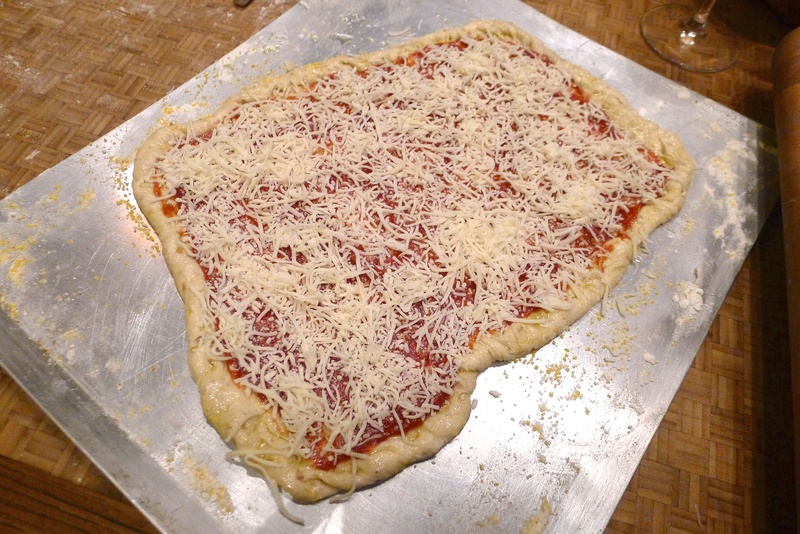 First came tomato sauce, some dried oregano, and a light mozzarella cheese layer. 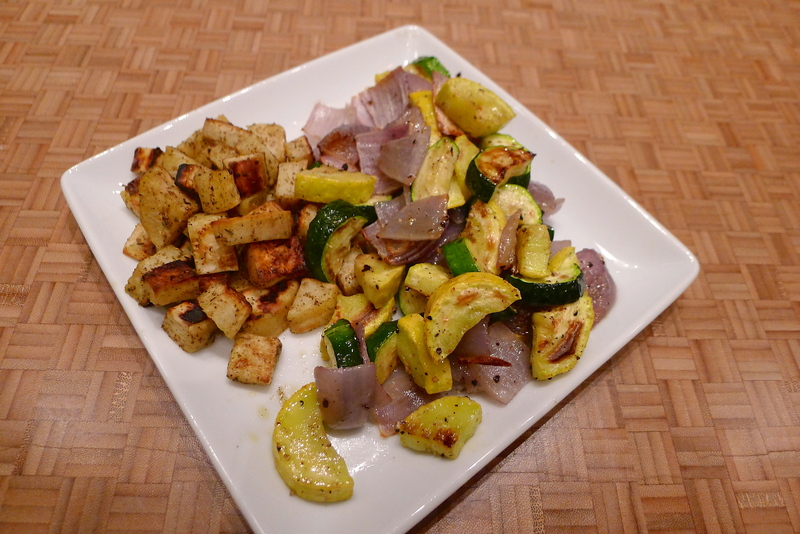 Next, I added the roasted veggies. 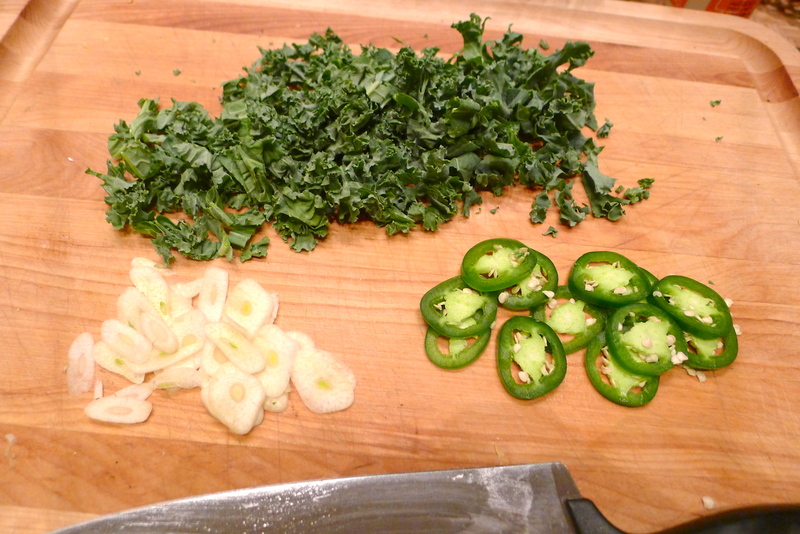 Over the veggies, I sprinkled the garlic and jalapeño slices and covered it all with the shredded kale. 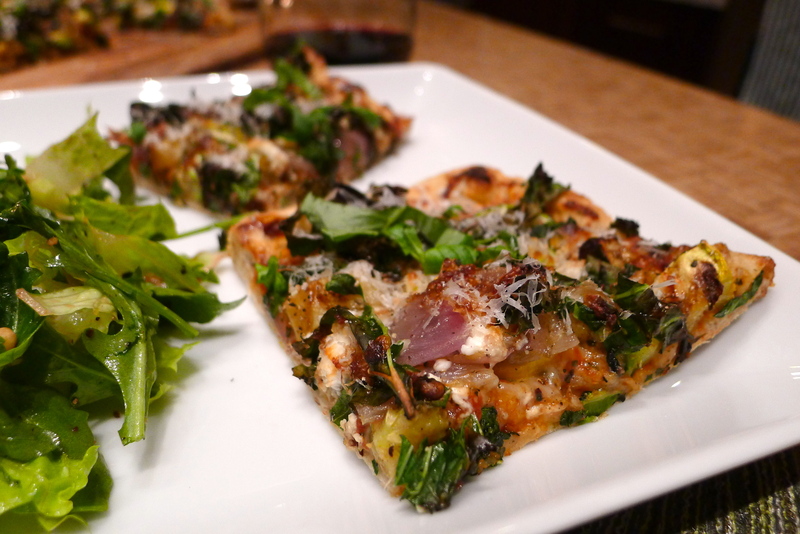 It was John’s smart idea to add dollops of goat cheese on top. Loaded! 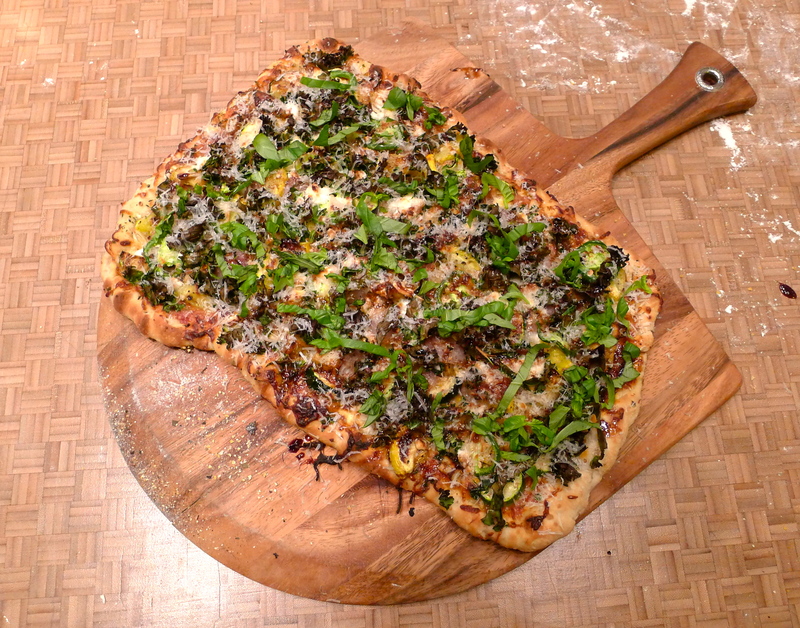 The pizza only takes a few minutes to cook on a pre-heated pizza stone. 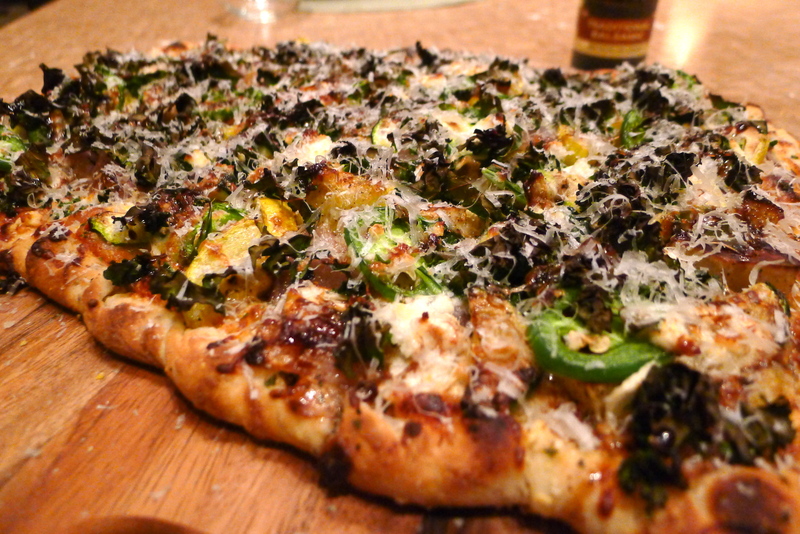 When it came out of the oven, I drizzled some balsamic reduction over it and added fresh basil. There is NOTHING wrong with this picture. 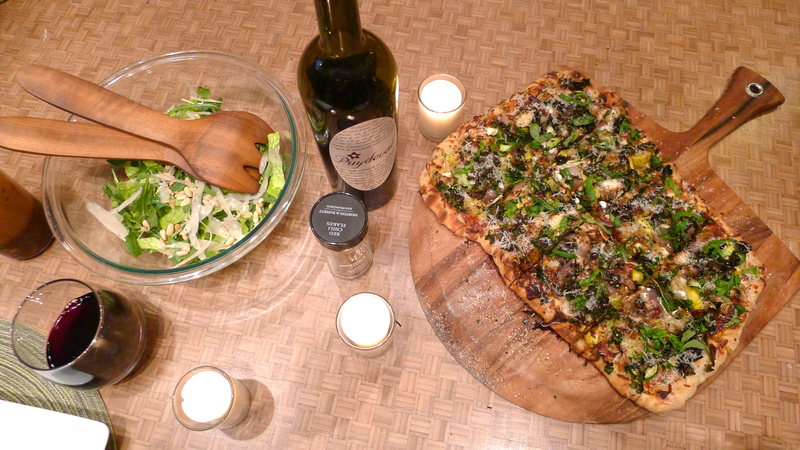 We enjoyed our vegetarian masterpiece with a simple arugula salad and good wine. 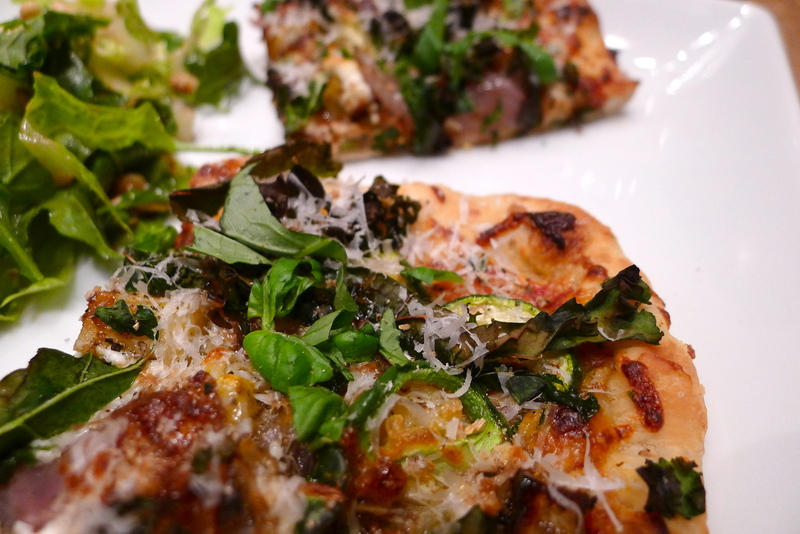 The pizza was full of flavor and texture. 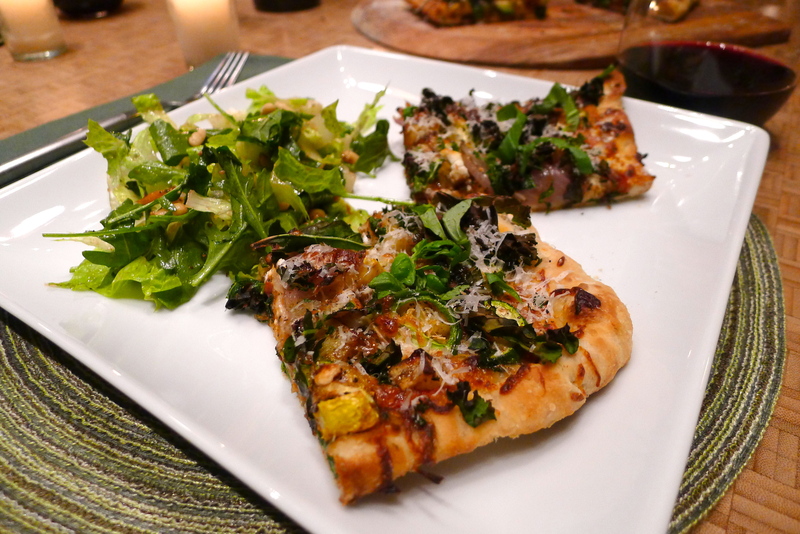 There’s a hint of sweetness from the potatoes and balsamic reduction, some heat from the jalapeño, a teeny bit of char flavor on the veggies and crust, and a tang from the melted goat cheese. 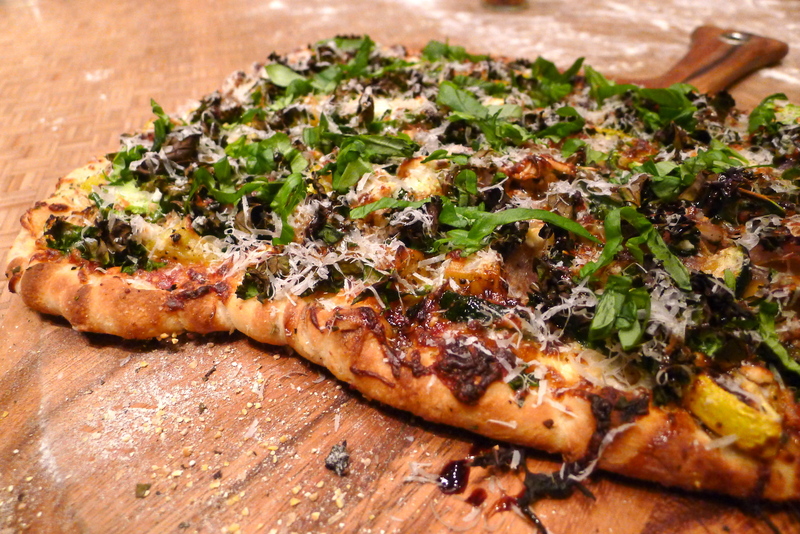 The kale was very crispy (a light drizzle of olive oil before baking might be smart). Scrumptious… and I never even thought about meat. Mission accomplished. 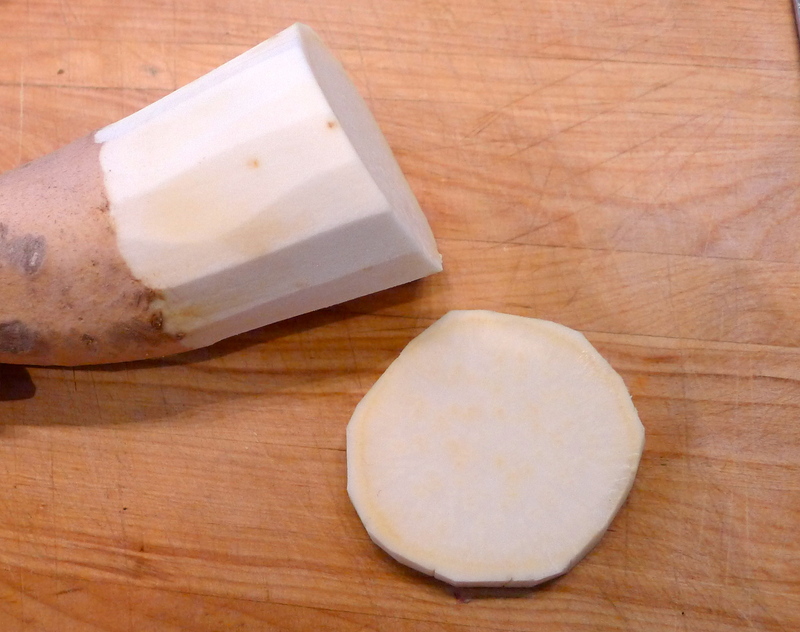 Toss the sweet potato chunks in a bowl with a swirl of olive oil, a dash of Italian seasoning and salt. 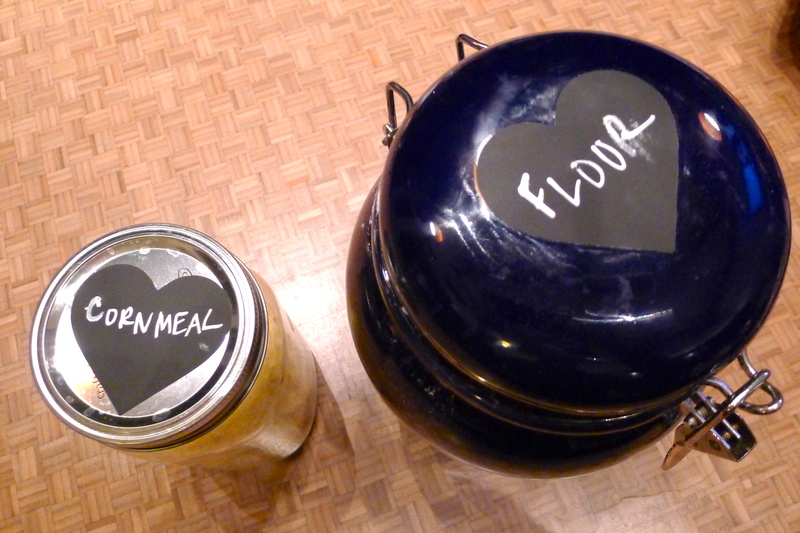 Spread on a baking sheet in a single layer. Roast for 20 minutes, stirring halfway, or until a bit browned. Remove and set aside. 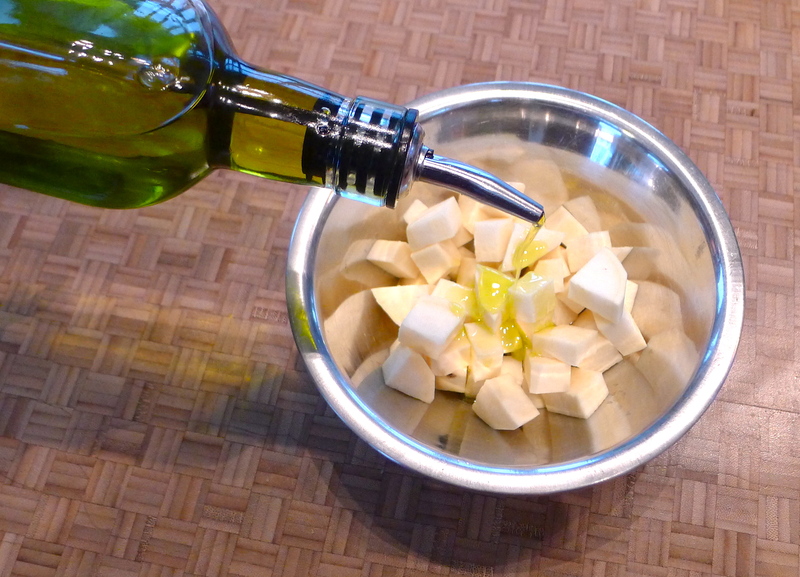 Toss the zucchini, squash, and onion in a bowl with a swirl of olive oil and a pinch of salt. 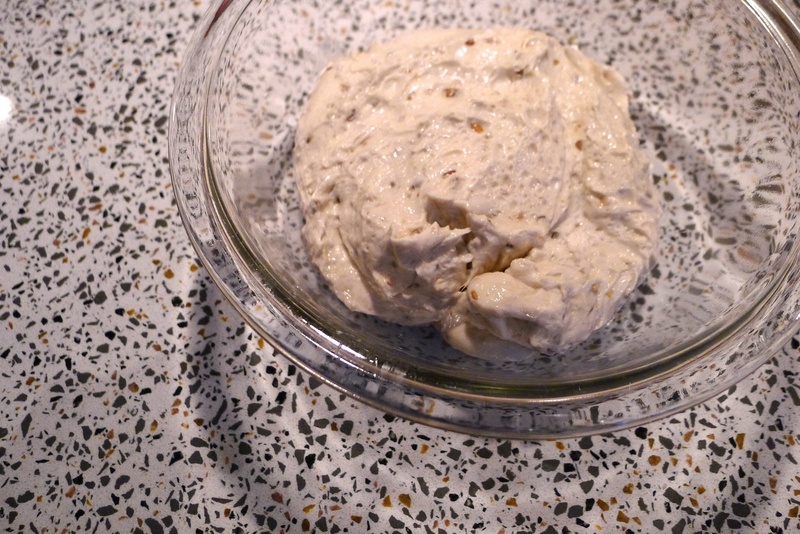 Spread on a baking sheet in a single layer. Roast for 10 minutes or less (depending on doneness), stirring halfway. 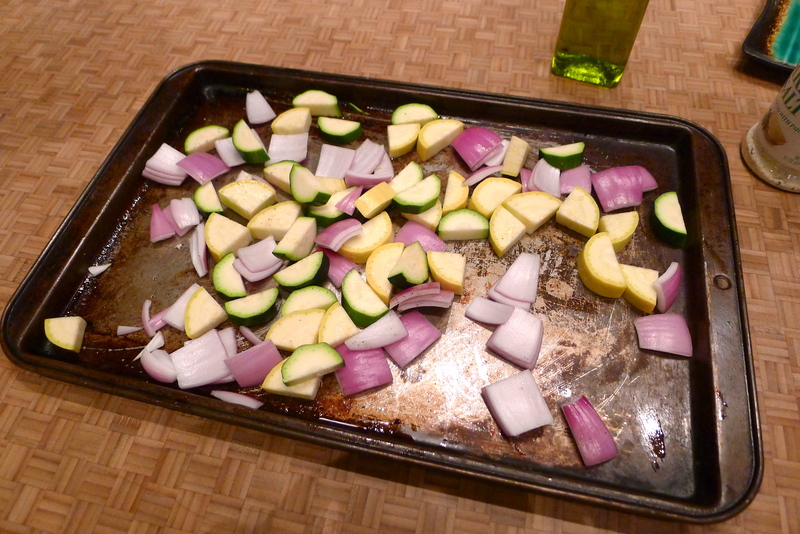 If necessary, turn on the broiler and brown the veggies for 2 minutes or so. Remove and set aside. 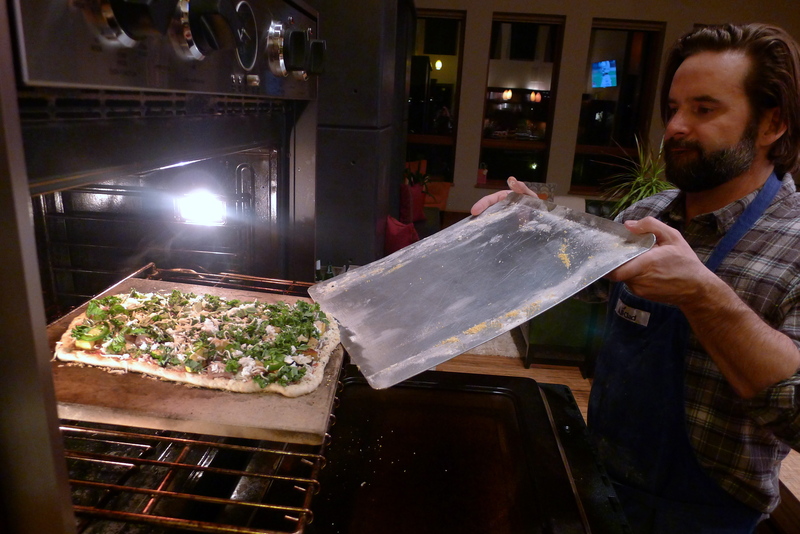 Turn up the oven to 450 degrees and place a pizza stone on the center rack. 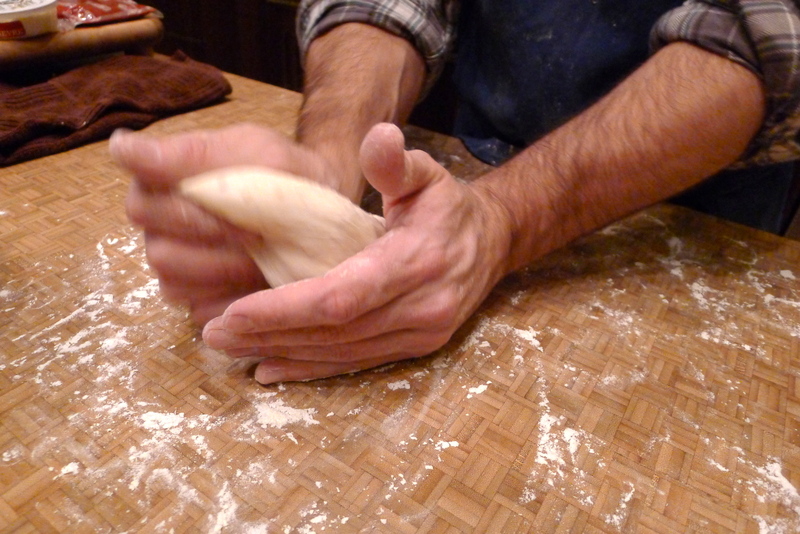 On a floured surface, roll out the pizza dough to ½ inch thick (or less). Roll the edges of the crush. 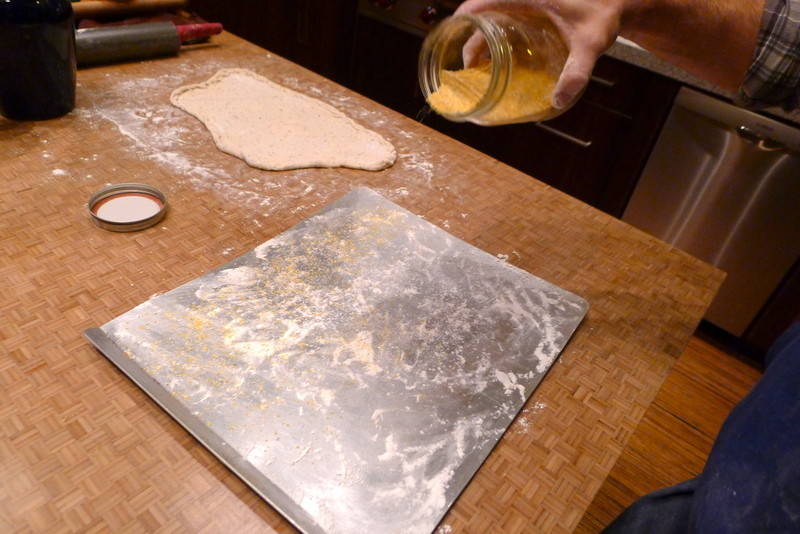 Transfer the dough to a sheet pan covered in flour and cornmeal. 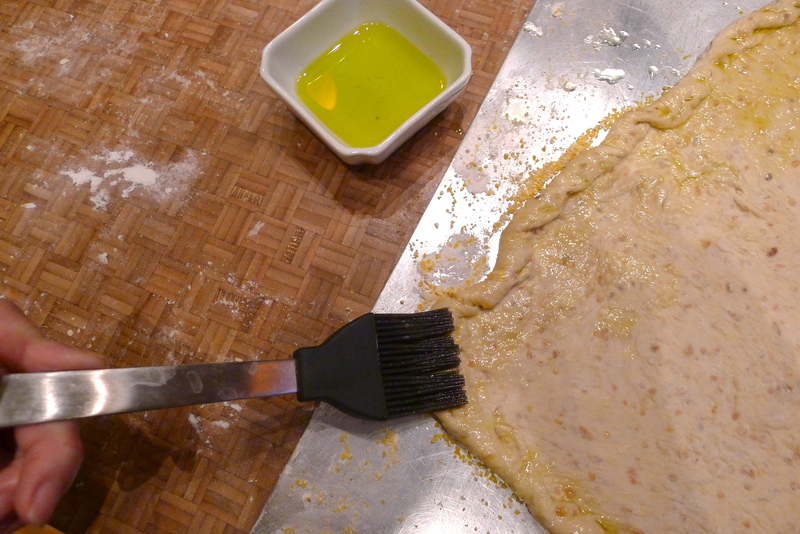 Brush the edges of the crust with olive oil. 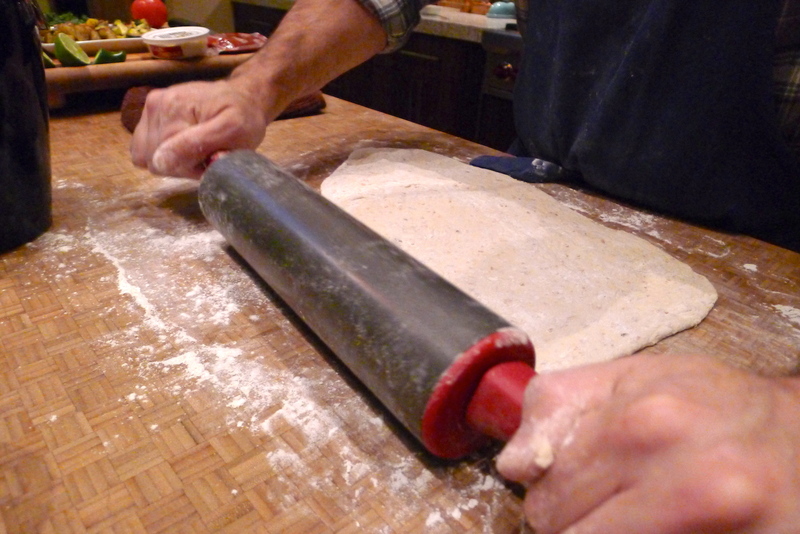 Spread the tomato sauce over the crust. 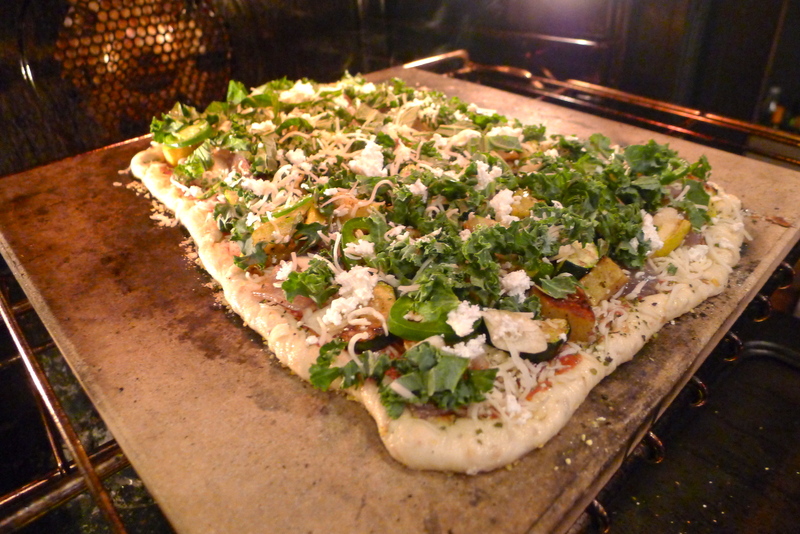 Sprinkle the oregano over the pizza and add a light layer of mozzarella cheese. 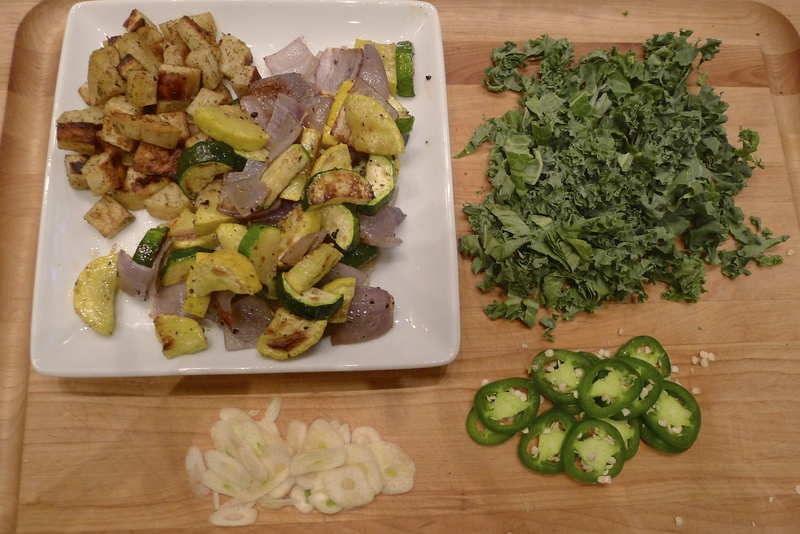 Add the roasted veggies, then the garlic and jalapeño, then the kale. 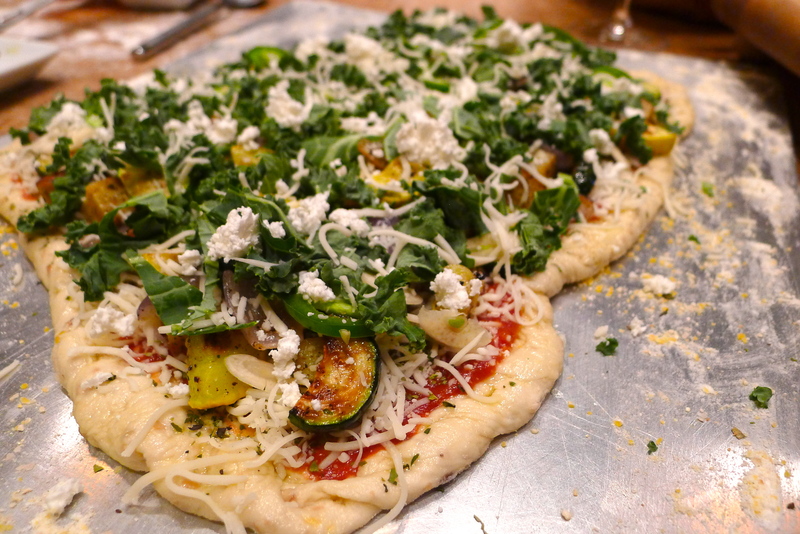 Add the goat cheese in dollops over the kale and sprinkle a little more mozzarella over everything. 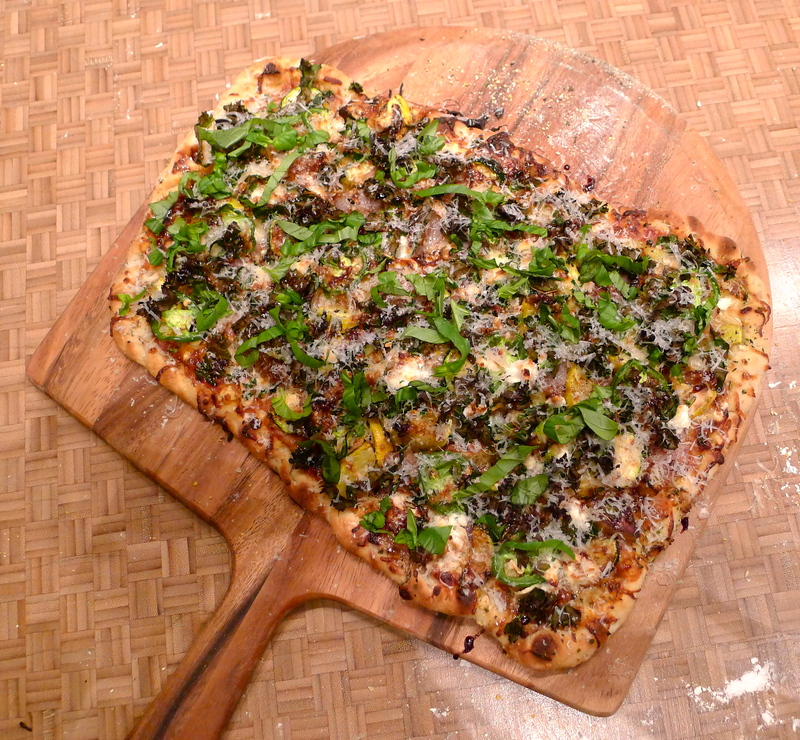 Before serving, drizzle some balsamic reduction over the pizza and sprinkle it with fresh basil. 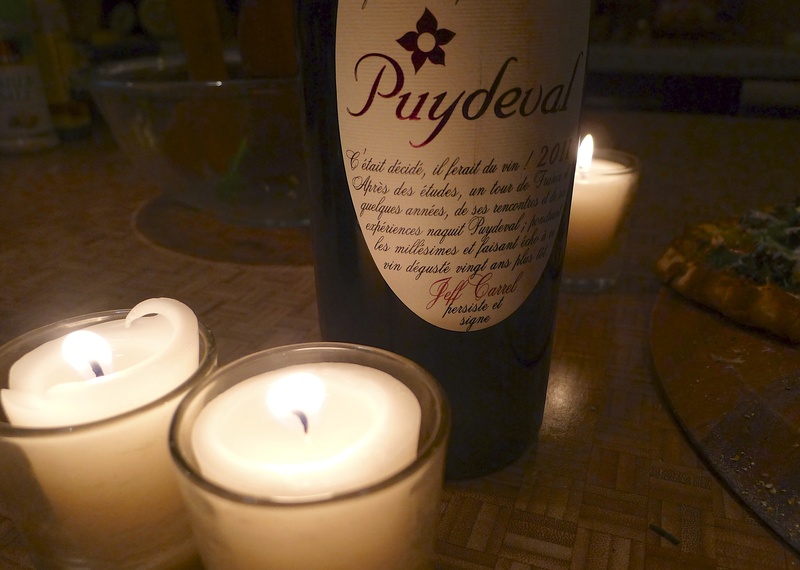 Enjoy with a simple salad and good wine. 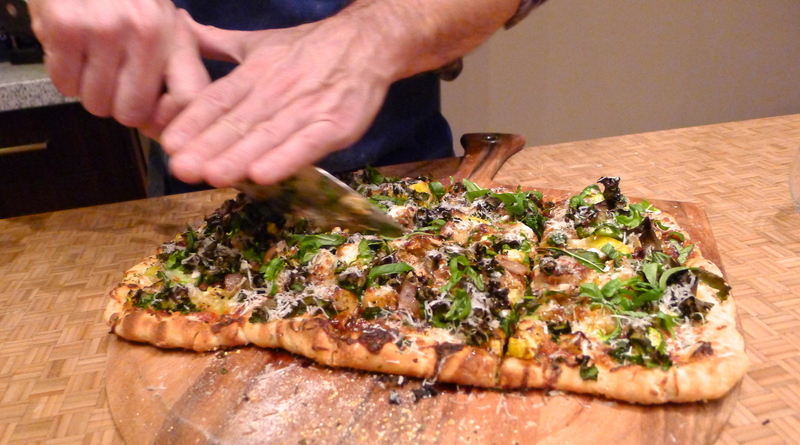 Cheers to another meatless masterpiece. YUM! Hungry for more? 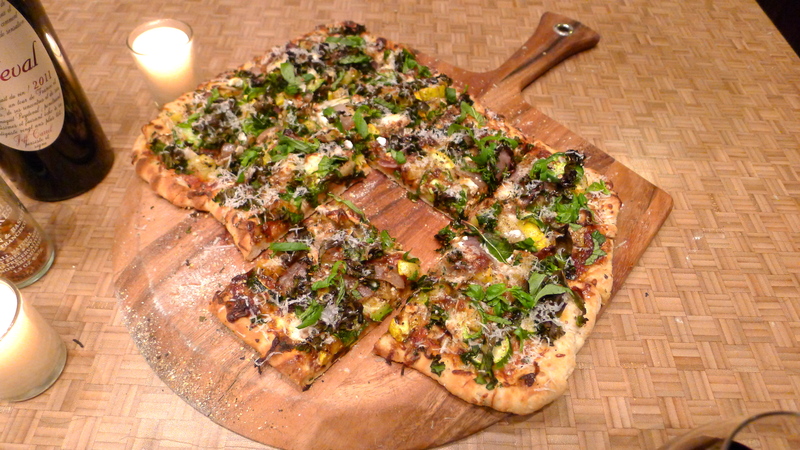 Find past pizza adventures and a collection of recipes on the FOOD BLISS page. 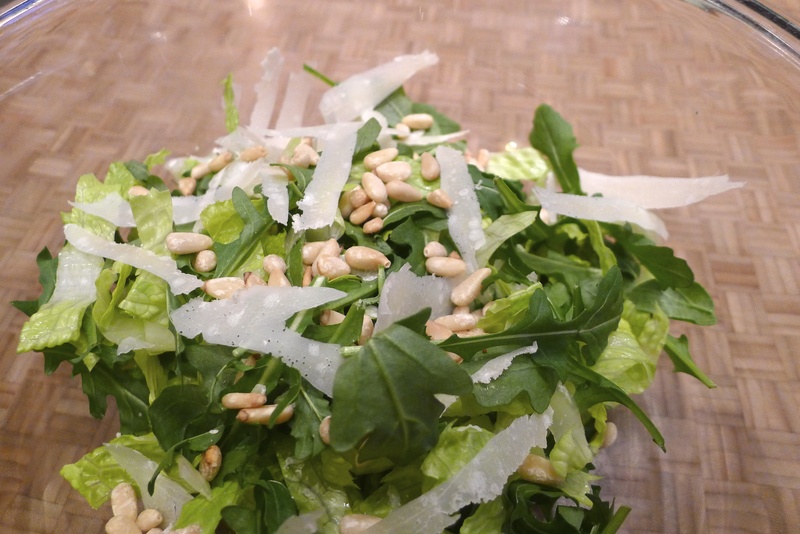 Follow along as I make a new recipe each week in 2015: the New 52. I’m a huge meat fan but your meatless recipes make my mouth water and I totally forget about meat!!! Thanks for sharing!! That looks absolutely amazing! My mouth is watering!